Dogs are man’s best friend, right? Of course, we would all agree that this is true since the special bond between a man and a dog is apparent. But we would also agree that not all homes are perfect for raising a pet. That is why homeowners need to adjust some things in the house to make room for a pet. Well, this includes your flooring. Instead of a carpet, you can opt for a laminated flooring, triple-sealed hardwood, tile or vinyl. You should also see to it that your house is fenced so that your pet will not run to the street when it goes outside. 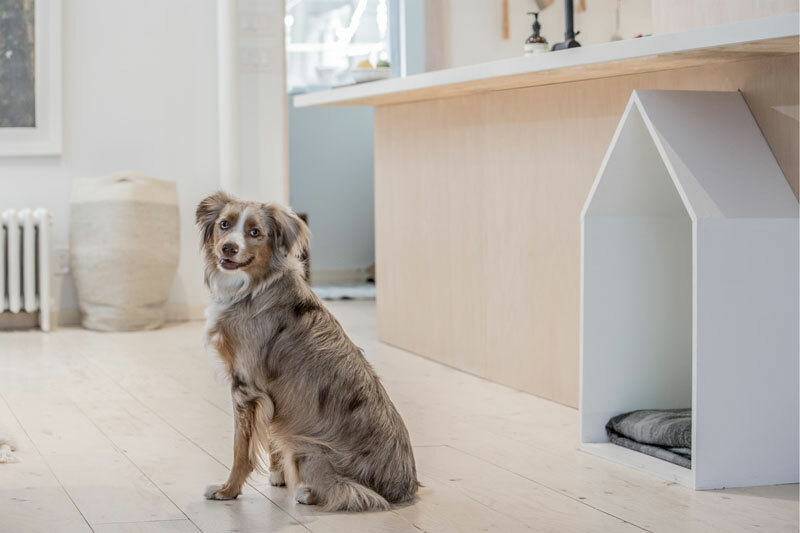 Some homeowners actually incorporate some items in the house so that it will be pet-friendly. Just like the house that we will feature today. 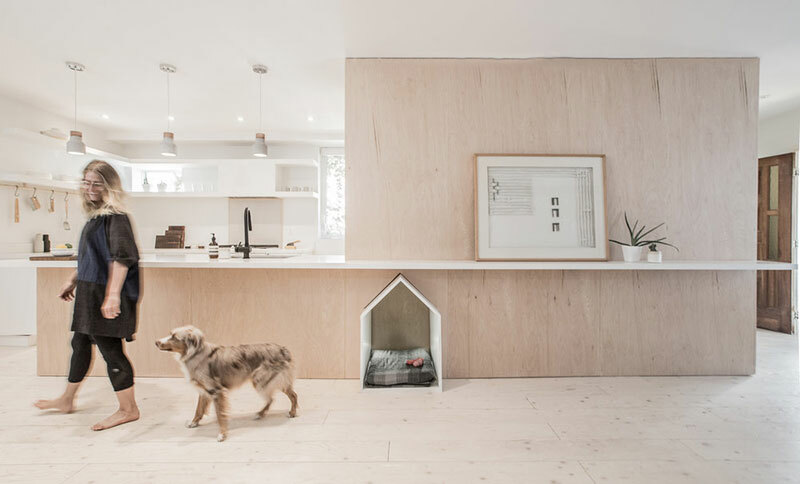 The house is called Sheridan residence and it integrated the dog’s house in the kitchen. Yes, that’s right. The dog’s house is located right in the kitchen. And it is not just the usual dog house that you are thinking about. It is actually part of the kitchen island! For sure you are now curious about how they did this. Now, scroll down and take a look at the images of the house. Unique feature: The design of this house considered the home owner’s pet dog. 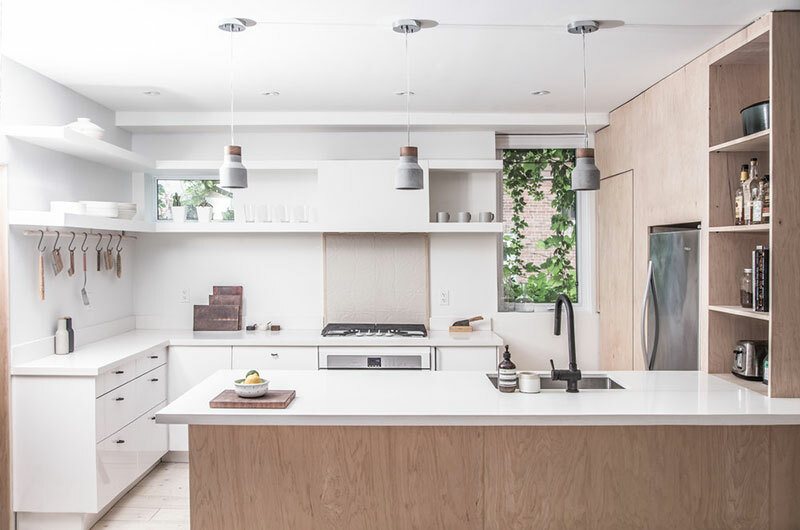 Studio AC designed the renovation of this house in Toronto. While doing that, they made sure to include a design element for the family dog. The homeowners requested for a space for a dog bed to be included in the design. 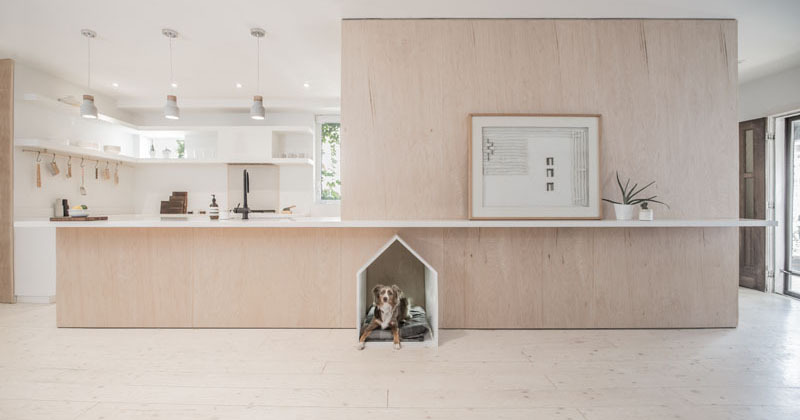 To satisfy that, the designers created a small dog house that fits into the overall design of the interior. 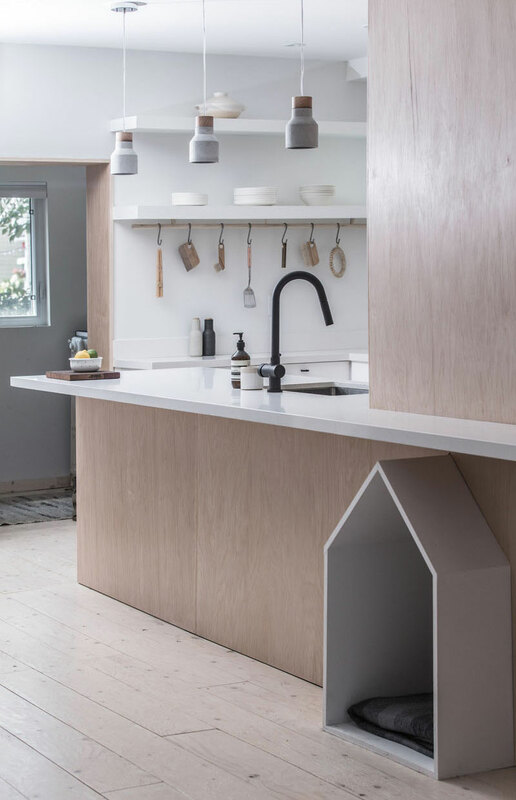 As part of the home’s renovation process, a central plywood box was designed that connects the kitchen, dining, living and entry. It also has a small nook cut out for a little white dog house. This gives the dog its very own space in the house. Isn’t the owner very thoughtful for doing this? This sure is one happy dog! The owner also made sure that her dog is comfortable while in the indoor home by providing a comfy cushion to sit on. 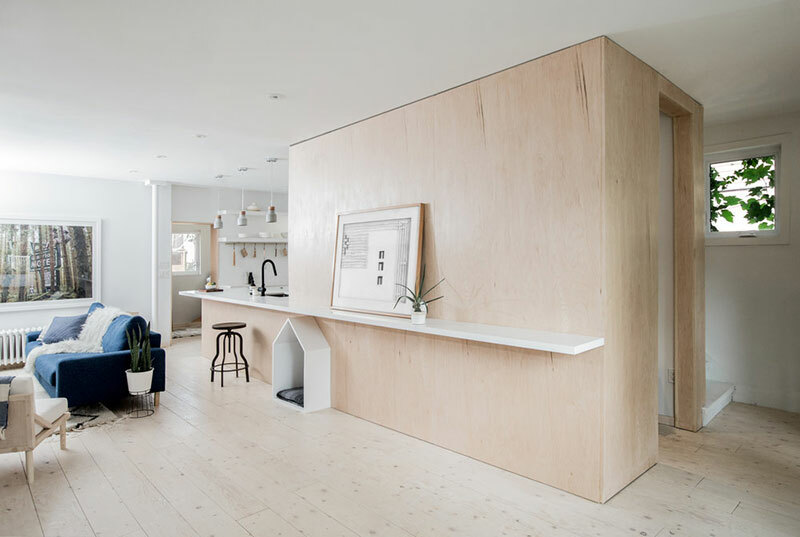 Most items in the interior are made of wood and the dog house is also a good match. Although painted in white, it is also made from wood. Seen here are the kitchen and living area. It is a good idea to add a blue sofa to add some pop of color in the space. Notice also that the living space has a large framed wall decor and area rug. 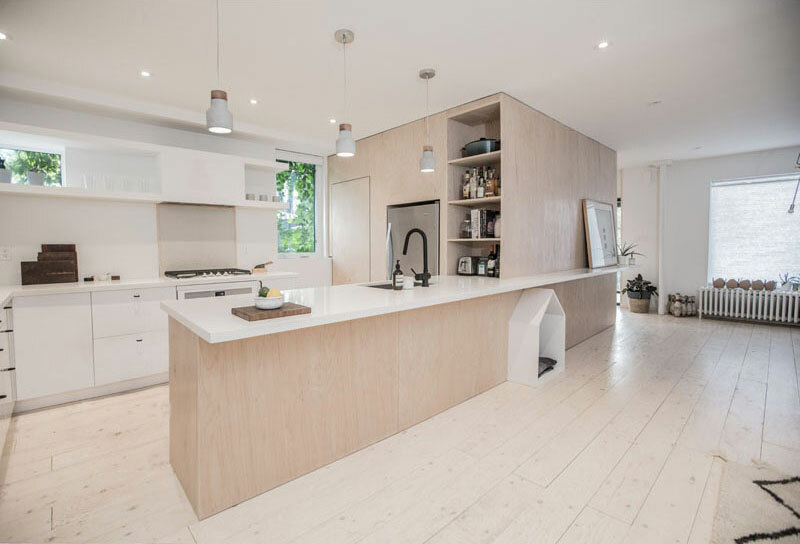 You can see here the white kitchen with open shelves. That window with vines on it adds drama to the area. It is also well-lighted and bright wherein its white ceiling is a big contributing factor to its brightness. 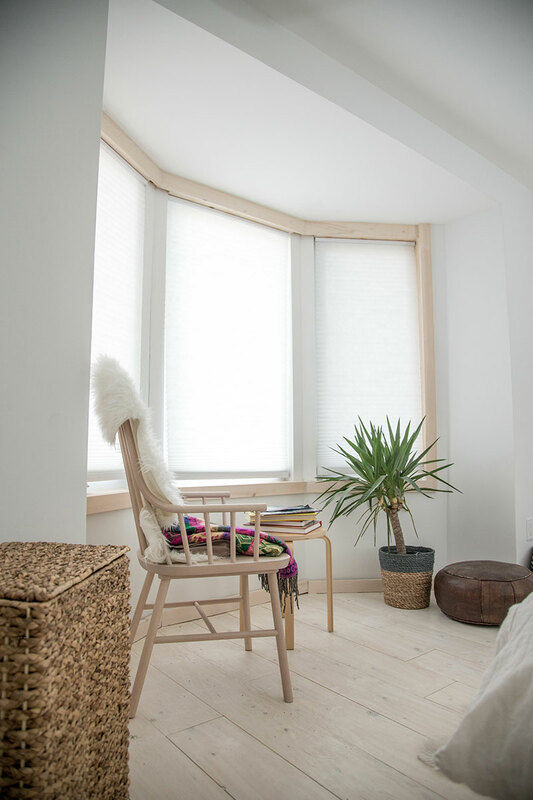 Combining wood and white in the space sure makes it stunning. 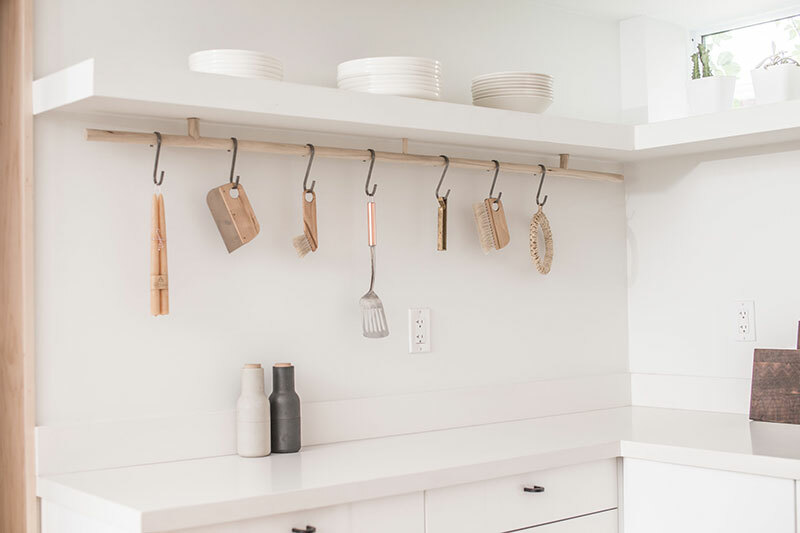 Although these items are used for the kitchen, it seems to double as a wall decor since they all look nice with the white background. 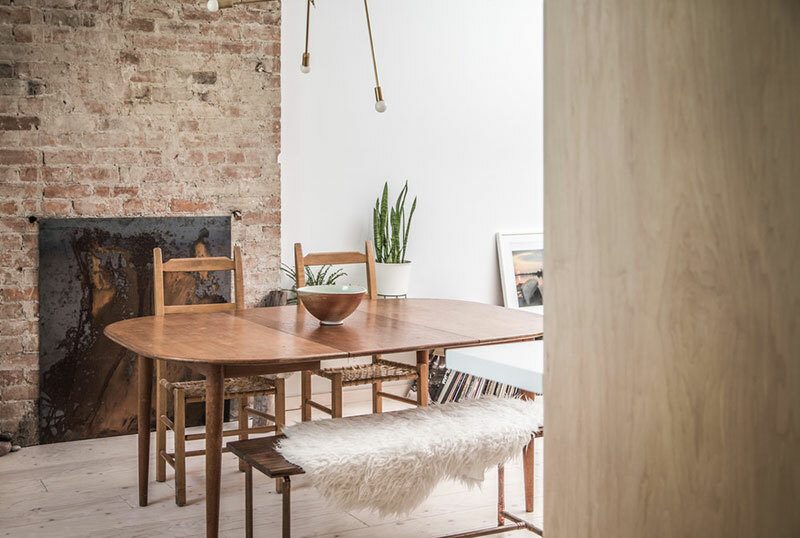 This is the dining area of the house which features a wooden dining set. That brick wall fireplace is such a lovely backdrop, isn’t it? But with the looks of it, it appears that the fireplace is no longer used and is merely covered by wall art, which looks perfect in it. This looks like the bedroom with a wooden side chair. There are some DIY ideas you can get from here just like that rope covered planter! Like the public spaces, this one also used wood and white together. 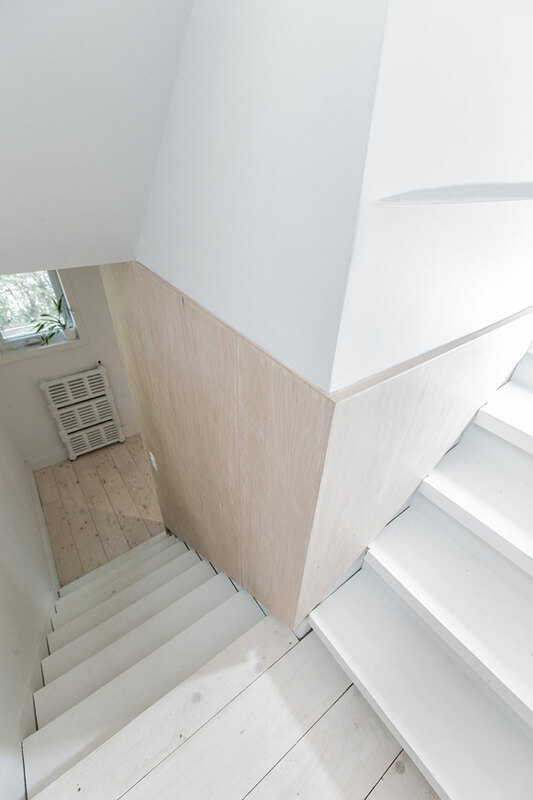 Lastly, you are looking at the staircase that leads to the upper area of the house. I assume that this is used to access the bedroom and maybe even another bathroom. 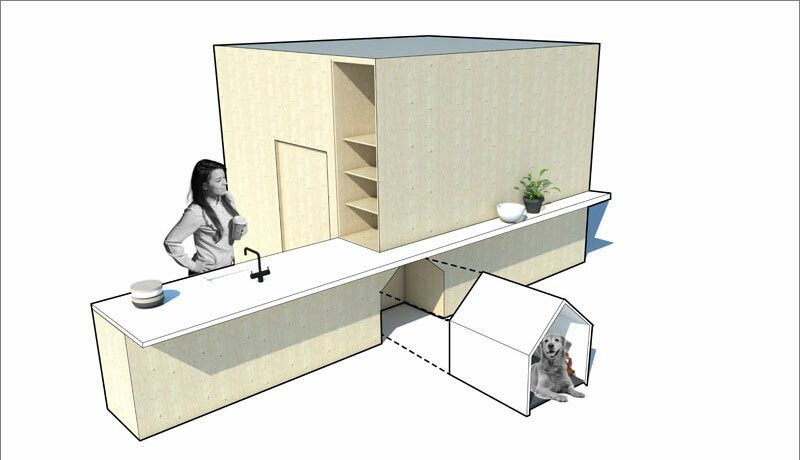 Now here is how the dog house is designed. You can actually pull out the entire house from the kitchen island. Nice, right? 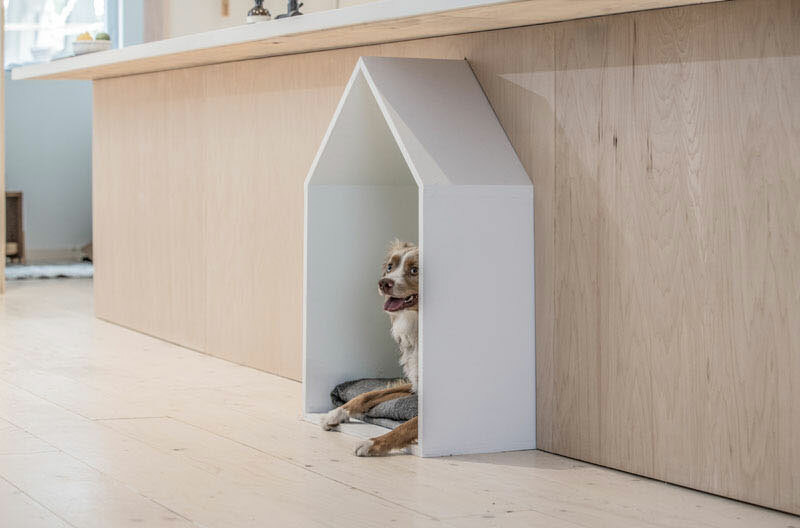 This project is from Studio AC and it sure is a creative way to add a dog’s house into your very own home. Aside from that, the other features of the home are also beautiful and impressive. It is not dull or boring despite its usage of neutral hues in the interior. In fact, it looks very relaxing and inviting because of its color, layout and its overall look. Anyone and everyone would love to live in a house that is as cozy as this one! I also love the decors and their choices of furniture. How about you, what can you say?